(August 10, 2011) --- Investors around the world are still reeling from last Thursday’s plunge in the US equity markets which was the worst day for US stocks since December 2008. Although crude oil, natural gas, Pittsburgh steel and other commodities fell sharply, Gold held its own. 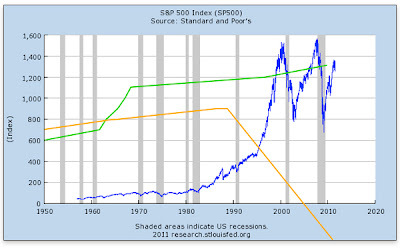 Over the past several years the S&P index (blue) has been very volatile, while the number of Green Bay fans who are Dow Jonesin' for stock in GBPI (green) has steadily gone up with each Packers title acquisition over the past six decades. 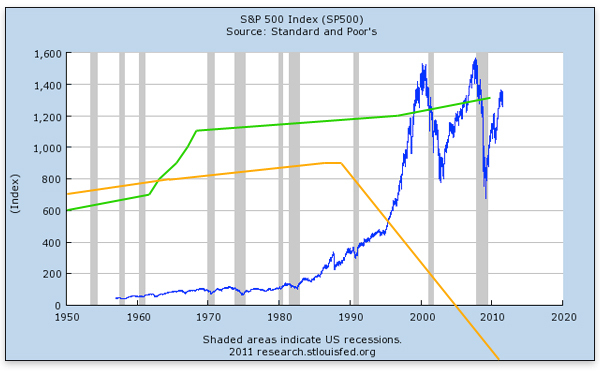 On the other hand, you'd have to be a total NASDIQ to invest in anything having to do with the Chicago Bears (orange). According to Wall Street's Kelly Ekas, "More than 69 stocks fell for every one that rose on the New York Stock Exchange... but for those of you who currently hold shares in Green Bay Packers Inc. (GBPI), congratulations... you’ve weathered yet another financial storm." GBPI shareholders say that the initial cost of their stock was worth every single invested cent... and all Packer Backers say they've been paid back exponentially thanks to years of blue chip players and numerous title takeovers. 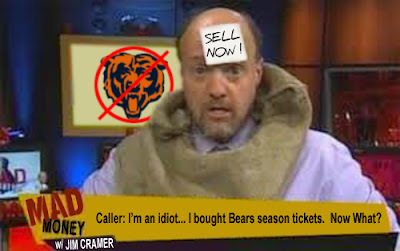 CNBC's Jim "Mad Money" Cramer recently stated, "Packers stock is even good in a Bear market... and that ain't no bull!!" The Green Bay Packers (NFL’s only publicly owned team) have sold shares four-times in their 91-year history; the first of which was in 1923 when savvy Wisconsin football fans bought shares with either $5 or 20-pounds of Colby Jack. Financial historians note the investment became so solid that despite the horrors of the Crash of 1929 and the Great Depression that followed, the value of GBPI stock never depreciated making it the first time in American history that there were several hundred Packers fans who could proudly and prestigiously call themselves NFL team owners... despite the fact they were homeless, hungry and unemployed. The Minnesota Vikings: The NFL's equivalent of Enron. 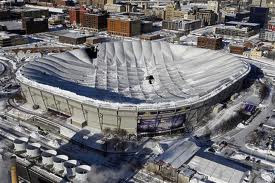 In related news, the financial credit rating agency Standard & Poor's dropped the Minnesota Vikings’ NFL ranking from C+ to a D- explaining that it grew very pessimistic about the team’s recent struggles over raising the Met ceiling. 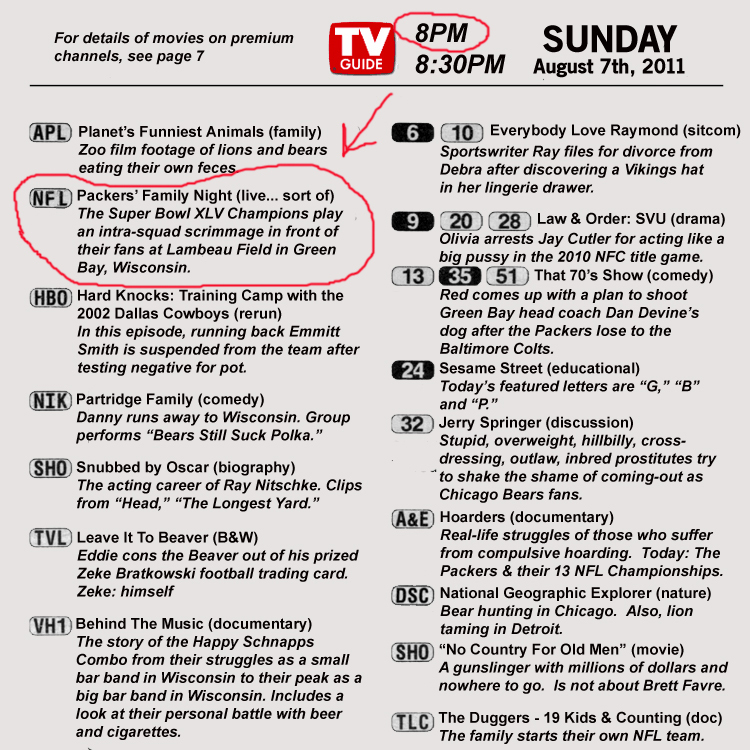 (August 6, 2011) --- Are you ready for some football?! That's right, it's just five-days until the Green Bay Packers, Chicago Bears and several other NFL teams play their first preseason games of the year! The Packers will be trying to recreate those special circumstances that lead them to the Super Bowl while the Bears will be using the preseason to acclimate themselves to a season full of frustration and extreme disappointment. 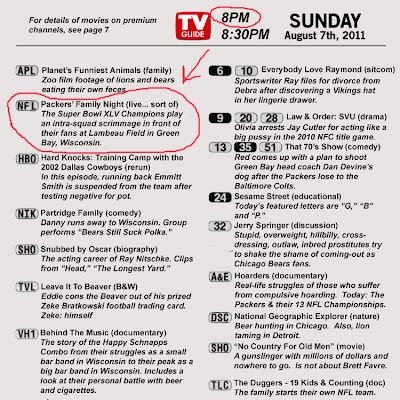 Remember to print out the above image taken from this week's TV Guide so you won't forget to watch the Green Bay Packers "Family Night" team scrimmage at Lambeau Field. Just be sure to post it on the refrigerator... because it'll burn on the stove. But for those of us who won't be able to make it to Green Bay this evening, the Packers' "Family Night" event will be rebroadcast on the NFL Network tomorrow evening (Sunday, August 7th) at 8pm (ET). So, be sure to set your TeVo's! And for those of you without TeVo's, get Tebow instead. The word is that Tim won't be doing all that much this season which means he'll have plenty of time to push the "record" button on your VCR.